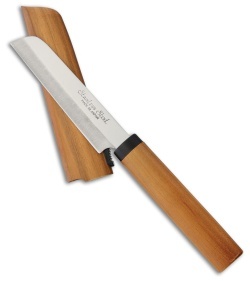 An affordable addition to any kitchen, the Kanetsune kamagata Fruit knife is the perfect tool for small detailed chopping tasks. 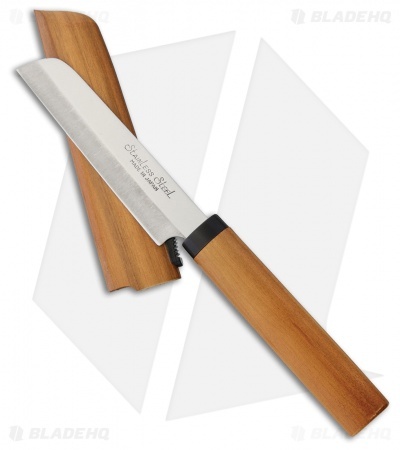 Featuring a 3.625" 420J2 surgical steel blade, popular for it's corrosion resistance and ease of sharpening, the sheepsfoot blade shape makes processing herbs and vegetables a breeze. Attractive wild cherry wood has been used for the handle and matching sheath for a functional and beautiful knife.